Please feel free to republish or share any of the images content in this blog post. Download a printable pdf flyer. 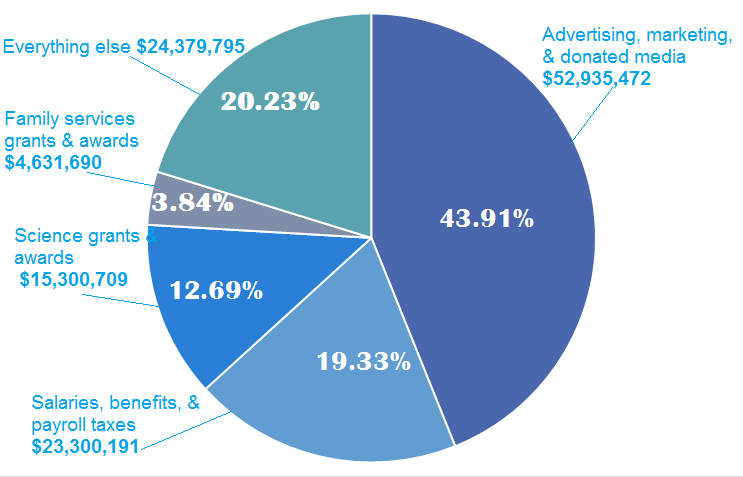 ***The data used to create this chart was extracted from Autism Speaks’ 2014 audited financial statements. You can find the original data here on Autism Speaks’ website. Please click images for alt text. In 2014 (like other years)Less than 4% of Autism Speaks’ expenditures support Autistic people and their families. 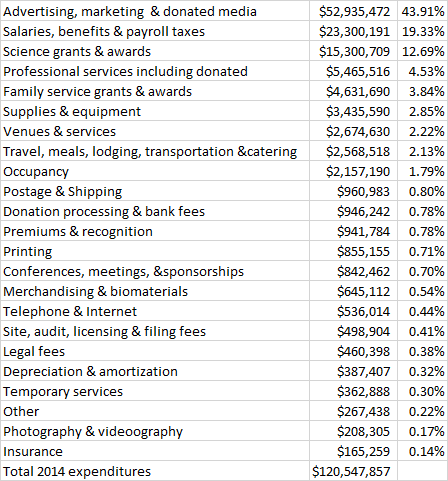 Salaries/benefits and associated expenses account for almost 20% of its expenditures. Donate to underfunded organizations that support Autistic people. In a post about shameful spending, we get a comment with a shameless plug. Nicely done. WOW. Shameful. Thank you for this information! Just another reason why Autism $peaks doesn’t speak for me. For years I’ve been telling people that Autism $peaks spends 52 cents of every dollar it collects on salaries, overhead and marketing and only 4 cents on services to autistic people and their families. Turns out I was underestimating the amount spent on salaries, overhead and marketing while overstating the amount they were spending on services. Autism Speaks doesn’t speak for this autistic ENTP. I am neither a fan of Autism Speaks or the ABA therapeutic model of treatment. Now, with the backing of the BACB(Behavioral Analyst Certification Board) ABAs are employing ‘RBT’s(Research Behavior Technicians) to monitor and participate in the care of autistic people. You can go to the BACB’s website to see the requirements to become an ‘RBT’ and you should be shocked and concerned that people with no formal behavioral training or background have to comply to such minimum standards to be around our children. It’s frightening. This is because people in the ABA community have already become too lazy and entitled to do the work for which it is they trained and if you don’t want to put in the time and effort then get out of the business of caring for people, because autistic people need compassion and understanding, not to be treated like pets, trained to be obedient, as to not upset those around them because they do not fit into what someone else thinks is ‘normal behavior’. My son, who was diagnosed as ‘borderline Aspergers’ at 5, is now almost 11 and receives what I like to call a crippling amount of therapy without having ever been retested since a) what is and is not autism with regard to Aspergers Syndrome has since changed and, b) he’s gone almost 6 years without follow up testing to see if, I don’t know, perhaps the initial diagnosis was incorrect. He is engaging, articulate, witty, and bright. Look at the chart above and see for yourself who Autism Speaks cares about. wow, thank you for the information. . . These pseudo helpful entities that are out for themselves should be treated as criminal and prosecuted. $23 Mil in salary…twice that in advertising? If there is nothing fishy about that I have bridge in Brooklyn I can sell you, cheap. You can click the link at the top of the post which will bring you to the full financials. It is a lot of money to call, “everything else” but including every account is not practical for the purposes of my post. I’m comfortable with this decision because I’ve made it very easy for readers to access the info by just clicking the link. Far easier for you to do that than for me to list it in a reply.